LEXINGTON, Ky. (June 29, 2016) – Continuing its collaboration to raise funds for important causes, the Breeders’ Cup and Maker’s Mark® announced today that Old Friends Farm, home to some of the most popular retired Thoroughbred race horses, has been named the official charity beneficiary of the 2016 Breeders’ Cup World Championships. The Breeders’ Cup, the most prestigious international two-day event, consisting of 13 races and purses and awards totaling $28 million, will be held on November 4-5 at Santa Anita Park in Arcadia, Calif. 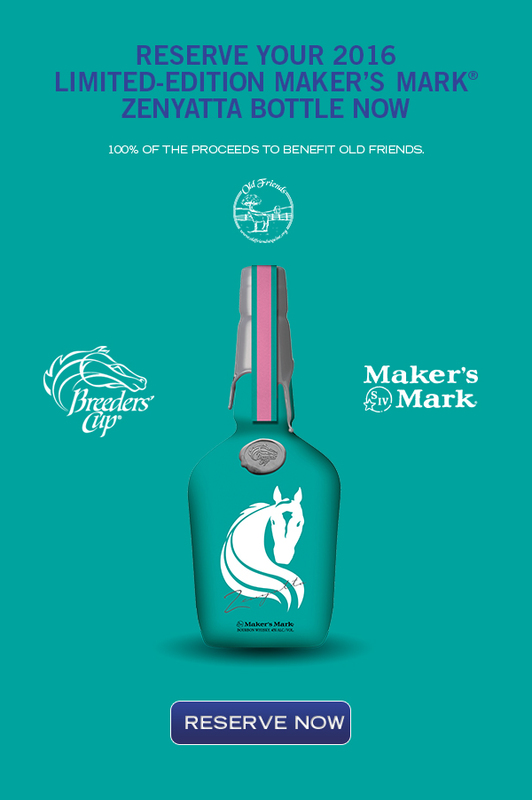 Fans can contribute to Old Friends and receive a Maker’s Mark® limited edition commemorative Zenyatta bottle, the first and only female horse to win the Breeders’ Cup Classic, by making a donation and attending the Championships for Charity celebration on November 2 in Arcadia, Calif. This year, Ann and Jerry Moss, owners of Zenyatta during her racing career, worked with both Breeders’ Cup and Maker’s Mark® in selecting Old Friends as the beneficiary of the 2016 bottle program. Breeders’ Cup and Maker’s Mark® have collaborated on a three-year program offering a limited-edition, five-bottle collection featuring a few of the most legendary Champions in Breeders’ Cup history. Each bottle pays tribute with a customized design and signature from each Champion’s connections. In the first year of the program, Breeders’ Cup and Maker’s Mark® offered fans the opportunity to donate towards the first three limited-edition commemorative bottles of Breeders’ Cup Champions A.P. Indy, Lure and Personal Ensign. In 2017, a limited-edition commemorative Maker’s Mark® bottle of Cigar will be offered. To support Old Friends, fans can reserve a bottle at www.breederscup.com/championsforcharity by making a $400 donation to receive a 2016 Maker’s Mark® limited-edition commemorative Zenyatta bottle. Once the donation has been made, those donors can collect their bottles at Arcadia Night: Salute to Zenyatta, which will take place on Wednesday, November 2 at the Gold Line Plaza, in Arcadia. In addition to collecting the commemorative bottle, the evening will include live music, local food trucks and signature Breeders’ Cup cocktails, among other special amenities. Old Friends is a 501 (c) (3) non-profit organization that cares for more than 160 retired racehorses. It’s Dream Chase Farm, located in Georgetown, KY, is open to tourists daily by appointment. Old Friends also has two satellite facilities: Old Friends at Cabin Creek in Greenfield Center, N.Y., and Old Friends at Kentucky Downs in Franklin, KY. For more information on tours or to make a donation, contact the main farm at (502) 863-1775 or see their website at www.oldfriendsequine.org. In 1954, at a small Victorian distillery in Loretto, Kentucky, Bill Samuels, Sr., fulfilled his dream to create a pioneering handmade bourbon that, for the first time, would appeal both to bourbon and to non-bourbon drinkers alike, that tasted good and exemplified good taste, and wouldn’t “blow your ears off,” which was the measure by which bourbons were judged at the time. He decided to make his whisky in small-batches of 19 barrels, developed a proprietary barrel char to enhance the softness and sweetness of his whisky, and then rotated each barrel by hand to ensure exposure to consistent temperatures throughout the warehouse, and, ultimately, he aged each barrel to taste. Bill Samuels, Sr., unknowingly and unintentionally, fired the shot that started the Bourbon Revolution, and transformed bourbon from a “commodity” into a premium handcrafted spirit, giving rise to the modern era of bourbon. Today, Maker’s Mark® continues to make its bourbon the same way Bill Samuels, Sr., did 60 years ago, in small batches by craftsmen who hand-dip each bottle. In 2010, in tribute to his father’s spirit of innovation, Bill Samuels, Jr., unveiled Maker’s 46®, a totally new bourbon that reflects the distinct character of Maker’s Mark® but has a bigger, bolder and complex taste without any hint of bitterness. In 2014, a limited 375ml bottling of Maker’s Mark Cask Strength, which is Maker’s Mark- uncut and unaltered, was released to select markets. The limited launch of Maker’s Mark Cask Strength generated tremendous enthusiasm and positive feedback, prompting a nationwide introduction of 750ml bottles in 2015. Maker’s Mark® Bourbon (45% alc./vol. ), Maker’s 46R (47% alc./vol.) and Maker’s Mark® Cask Strength™ Bourbon Whisky, (54%-57% alc./vol.) are distilled, aged and bottled by the Maker’s Mark Distillery, Inc., in Loretto, Kentucky. In 1980, the distillery was designated a National Historic Landmark, becoming the first distillery in America to be so recognized, and has also been decreed as the “world’s oldest operating bourbon whisky distillery” by Guinness World Records®. The Maker’s Mark Distillery is one of the Commonwealth of Kentucky’s most popular tourist destinations, attracting hundreds of thousands of visitors annually. For more information, please visit the Maker’s Mark® website (www.makersmark.com). The Breeders’ Cup administers the Breeders’ Cup World Championships, Thoroughbred racing’s year-end Championships. The Breeders’ Cup also administers the Breeders’ Cup Challenge qualifying series, which provides automatic starting positions into the Championships races. The 2016 Breeders’ Cup World Championships, consisting of 13 grade I races and purses and awards totaling $28 million, will be held November 4-5 at Santa Anita Park in Arcadia, Calif., and will be televised live by the NBC Sports Group. Breeders’ Cup press releases appear on the Breeders’ Cup Web site, www.breederscup.com. You can also follow the Breeders’ Cup on social media platforms Facebook, Twitter, Instagram, Snapchat and YouTube. It is so pretty. Kudos to the graphics folks! Right On! Beautiful tribute. Have to admit I was not aware of this battle. Thanks for the history lesson. This is such a lovely tribute. You have moved me to tears with your writing. I only know of the Battle of the Somme through history, but I do remember that this war was the turning point of how wars were to be fought. Such huge sacrifice! We must always remember these brave souls and all of those who fought for our freedom and safety. Thank you, dear friend, for reminding us of these important touchstones. Rest in Peace, brave warriors all. Dear Marshall.Thank you for your kind words.As you know I am very proud of our little Island.I will never forget the men,women children and animals who have died to keep our country free.They will rest in peace forever because they valued our way of life and paid the ultimate sacrifice.Treasure your independence.Love and hugs Sheena. We visIted Old Friends a few years ago and fell in love with everyone. God bless the Mosses for continuing to have Zenny support this organization. The woods, rich from well-spaced rainfall, make almost solid shade so that nothing gets enough sunshine. The shade garden thrives from this unusual season and the hostas, caladiums, and elephant ears are in their glory. The ferns would like a little more light-which will come as the season advances. Light is so important to nature and to us humans. Seeing the sunshine on a hilltop or on a field of bright orange flowers gives us a spurt of energy because we are seeing life. Sometimes when the sun is getting low in the west and seems unable to reach anything, an amazing event occurs: something begins to glow down in the dark woods. A shaft of sunlight has found an opening in the foliage and a tree glows as though from within. So it is with each of us. When we are inwardly lighted, we are greatly improved. I don’t want to settle. I love to roam over the prairies. There I feel free and happy, but when we settle down we grow pale and die. Sorry I am lateI have been watching the service at Thiepval.Very moving tribute to those who were lost this very sad day on the battlefield of the Somme. Thanks for Hovis. Sounds like he’s had a pretty upbeat week. Safe trips to all horses and jockeys. Meet Ceri and Tegid what a difference in size!The egg has been sent to Sheffield University for analysis but they were so well behaved!Sheena. Wishing all our Canadian friends a lovely, happy Canada Day! Big Congratulations to Hudson T.!! Well done, beautiful girl, you rock! Thanks for the news, JB. There’s a Friday surprise – a new post with lots of photos of Zenny getting new shoes (no news, though). TRAVEL ALLLLL THE WAY TO CALI TO PICK IT UP? REALLY??? ?